Poker Pals in Chillingo’s first foray into the iPhone app card game scene. 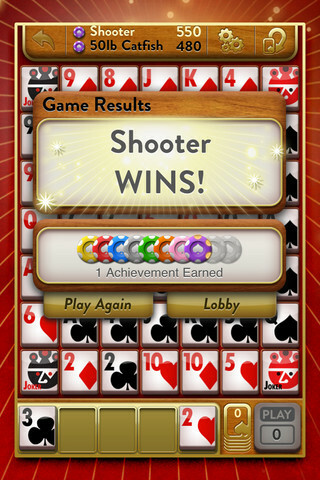 Unlike many poker clones, this iOS application is not just a boring table or card match. Instead, this is an application where careful strategy and planning pays off in a big way. In a nutshell, Poker Pals is a rather surprisingly pleasant combination of Poker and Scrabble. The now-popular iPhone app ultimately feels like it was developed by an experienced team, and is a joy to play against your friends. Much like Dominos, Scrabble, Words with Friends and even Boggle, Poker Pals is played on a large tile board, where players stack their cards, up to 4, vertically and horizontally in order to gain points. Instead of letter tiles, gamers are given poker cards. The goal is to stack as many good hands as you can onto each other, and block your opponents progress with bad cards. 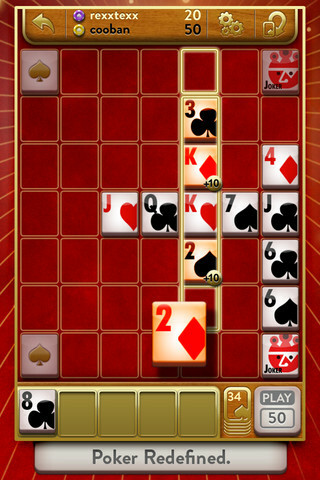 Joker cards act as blank tiles, which can lead to some nasty scoring opportunities. For fans of poker or other card games, the new innovation on the traditional favorites is a huge draw. The ability to not just lay down your own cards, but to also screw over your friends is a great addition to the old Texas Hold Em playbook. The gameplay can be as deep as you choose, with more experienced players laying down bad hands on purpose to open up other opportunities, or even swapping cards for possible flushes or straights. The gameplay in Poker Pals is fun and addictive. One of the best features in Poker Pals is its one-device interaction play system, where gamers can play on their iPad , iPhone or iPod Touch with users of all three systems. This makes finding someone to play fast and easy. Gamers are able to keep an extensive friends list, and can have up to 4 games going at a time on the free version of the app. There is no time limit for each match that I know of, so if you are busy one week, you won’t lose your progress. Still, some of these features aren’t quite what they could be. The most frustrating part of Poker Pals is the lack of any sort of chat mechanism for each separate match. This makes it impossible, or at least more difficult, to talk trash to your friends and claim intellectual superiority over them. The graphics are unfortunately not very colorful or interesting, and Poker Pals lacks the fun sound effects of Words with Friends as well. Also, while the game can get deep in terms of strategy, it doesn’t compare to games like Scrabble or Words with Friends in terms of sheer intellectualism. If you like mind games, Poker Pals will seem like a light distraction from the deeper competition. All in all Poker Pals is a great, light iOS app that is a worthy purchase if you have plenty of friends who enjoy similar gameplay types. Just don’t expect a real brain teaser. AppSafari review of Poker Pals was written by Darius Reimm on November 15th, 2011 and categorized under App Store, Board, Fun, Games, Multiplayer. Page viewed 4845 times, 2 so far today. Need help on using these apps? Please read the Help Page. I have poker pals on my I phone and enjoy playing it. However what i don’t like is if i don’t finish game and come back to it it is listed but i can not bring it back up to finish game, so after so many like that i have a large list of unfinished games. The only way i can clear them is take off poker pals and re download it. Also there is no way to comunicate with poker pals to find out how to retrieve games not finished. Also i try to upgrade and it asks for email and password. When i type in email and not having password, or forgot password. i get answer that new password will be sent to my email address. I never receive password.